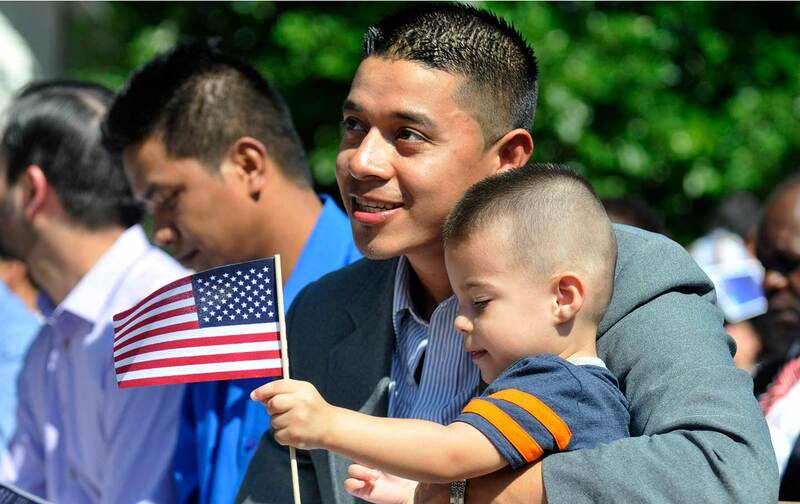 Immigrants are already not eligible for public benefits for five years after their arrival. So why did Trump act like they are? Last Wednesday, at an Iowa rally reminiscent of his freewheeling campaign stops, President Trump floated more anti-immigrant restrictions before the crowd. “Those seeking admission into our country must be able to support themselves financially and should not use welfare for a period of at least five years,” Trump told his audience. Trump dutifully read this supposed potential policy off a teleprompter until he got to his whopping finish, which was cut off by roaring applause from the crowd. The only problem? It’s already the law. As it is, with only very narrow exceptions, immigrants already must wait for a period of five years before they can access federal public benefits like Medicaid, Supplemental Nutrition Assistance Program benefits (formerly known as food stamps), cash assistance, and Social Security benefits. Undocumented immigrants are ineligible for these benefits. The 1996 welfare-reform law signed by President Bill Clinton is what restricted access to benefits for many immigrants. Lawful immigrants and refugees and asylees who entered the United States prior to August 22, 1996, generally were eligible for this suite of benefits. But after the passage of welfare reform, those who entered after that key date were barred from accessing federal public benefits for at least five and sometimes seven years. In subsequent years narrow exceptions were made so that children and those on disability could receive food stamps, and states were also given discretion to sort out how they wanted to handle eligibility for programs like Medicaid and cash assistance. As it is, immigrants use public benefits like Medicaid, SNAP and cash assistance at a lower rate than low-income native-born Americans. Of the more than 40 million immigrants in the country, more than a quarter of native and naturalized American citizens use Medicaid, while only a quarter of noncitizens do, according to the Cato Institute’s 2013 analysis. Low-income noncitizen children are the least likely to receive Medicaid, largely because of the 1996 welfare-reform law which limited their access. Similar uneven rates of usage exist across other federal aid programs. What’s more, undocumented immigrants who are barred from accessing these programs actually support them. In a 2013 review, the Social Security Administration’s actuary estimated that undocumented immigrants pay some $13 billion into the nation’s retirement fund every year, while they received only about $1 billion in return. Millions of undocumented immigrants, many who’ve lived here for decades and who want to be prepared to show their good-faith contributions to the country, do pay taxes. Without immigration reform enabling them to change their status, they won’t reap the benefits of their labor. Twenty years ago, Congress already asked immigrants to put the rest of the country on their back. Forty percent of the cuts in the 1996 welfare-reform law that went to finance reform targeted lawfully residing immigrants, says Broder. “Many states have recognized over the years that it makes sense to invest in important care and programs for low-income children and pregnant women,” Broder says. If the interest of policy is to “maintain healthy, productive communities and support those who contribute to our local and national economies,” Broder says, the five-year ban is a “policy that is counterproductive.” Some states have recognized that. A California law passed in 2015, for example, expanded Medi-Cal—the state’s MediCaid program for low-income populations—to everyone in the state under the age of 19 regardless of immigration status. In doing so, California joined four other states—Illinois, Massachusetts, New York, Washington—as well as the District of Columbia. Illinois, which passed its MediCaid expansion program in 2005, found that doing so led to healthier outcomes for the state’s kids. Increases in the rates of insured children were associated with decreases in high-school dropout rates and increases in four-year college graduation rates, according to the Illinois Business Immigration Coalition. So what is Trump up to? There are a few potential scenarios. Trump likes to portray immigrants as dangerous, bloodthirsty criminals. He’s fond of casting immigrants and, separately, Muslims, as threats to national security. He’s also fond of depicting immigrants as job-stealing drags on the economy. Going after immigrants’ access to public benefits fits into his us-versus-them worldview, where outsiders are a threat to insiders (that’d be worthy Americans), and where immigrants and Americans inhabit distinct identities that never overlap. He’s already translated this rhetoric into policy—his Muslim ban is his marquee policy. His ramping-up of immigration enforcement and raids on undocumented and deportable immigrants is another example. His creation of the Victims of Immigration Crime Engagement (VOICE) office, which allows people to call in a hotline to report crimes committed by suspected immigrants, is yet another. And in this case, any law about public benefits accessibility and wait times for eligibility can be made more restrictive. But Trump has other, more extreme policy proposals up his sleeve. As a candidate he proposed ending birthright citizenship. He’s proposed not just eradicating undocumented immigrants from the United States, but also lowering the caps on the number of legal immigrants allowed into the country. There’s also that wall he wants to build—now with solar panels for energy efficiency. His comments in Iowa may have been the political equivalent to floating a test balloon, seeing how much the public can stomach. But there’s also the strategy of shocking people over and over and over, until something radical seems plausible. Like returning to a 20-year-old law to force immigrants to shoulder even more of the social safety net than they already do.